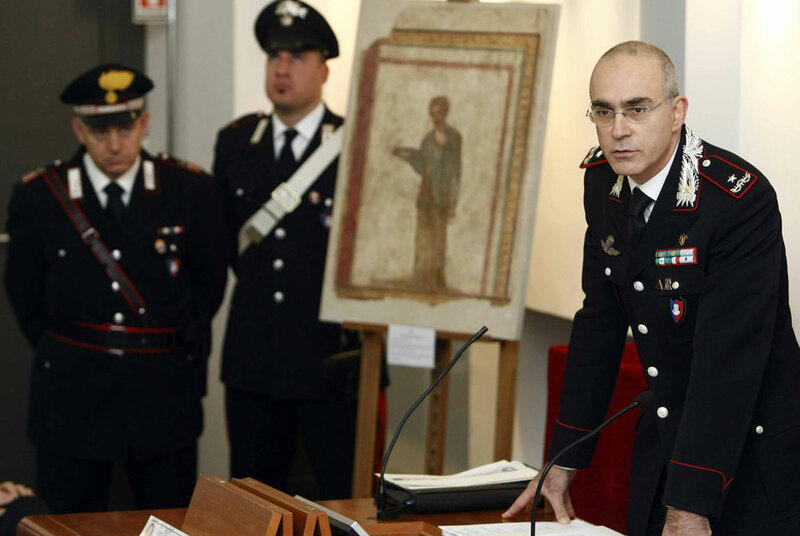 Italian Carabinieri paramilitary police general Giovanni Nistri talks, next to a plaster wall painting dating back to the first century A.C. during a press conference in Rome on occasion of its return to Italy, Thursday, Jan. 14, 2010. Italy's art police said Thursday they had recovered or seized nearly 60,000 pieces of looted or stolen artwork and archaeological artifacts worth euro165 million ($239 million) last year. That compares with the euro 183 million in stolen or looted art and artifacts recovered in 2008, the Carabinieri art squad said in its annual accounting of the government's efforts to recover looted antiquities and stolen artwork. AP Photo/Pier Paolo Cito. ROME (AP).- Ancient frescoes, statues and decorated vases that graced tables more than 2,000 years ago were among tens of thousands of artifacts recovered last year by Italy's art police, officials said Thursday. Authorities said they recovered or seized nearly 60,000 pieces of looted or stolen artwork and archaeological artifacts worth euro165 million ($239 million) in 2009. That compares with the euro183 million in art and artifacts recovered in 2008, the Carabinieri art squad said in its annual accounting of the government's efforts to recover looted antiquities and stolen artwork. Police figures show the number of illegal archaeological excavations discovered in 2009 decreased dramatically, from 238 in 2008 to just 58 in 2009. But at the same time, the number of people charged with falsifying artwork rose more than 400 percent. Giovanni Nistri, the commander of the Carabinieri's art squad, said most of the falsifications were of modern art "probably because the art of today is easier to falsify with fewer technicalities." In all, Italy recovered 39,584 looted archaeological artifacts and 19,043 other culturally important works, including entire libraries, in 2009, officials said. Among them were 137 artifacts returned to Italy from Switzerland which had been in the possession of Zurich-based restorers Fritz Burki & Son. Burki is known for having restored the Euphronios krater, one of the finest ancient Greek vases in existence. The Metropolitan Museum of Art in New York purchased it for $1 million in 1972 from an art dealer later accused of acquiring looted artifacts. The vase was returned to Italy last year. The Italians are working with Swiss authorities to locate another 300 missing pieces believed to have been in the Burkis' possession, a Carabinieri press release said. Some of the 137 recovered pottery pieces, statues and other artifacts were on display at a press conference Thursday, along with a 1st century A.D. fresco and a banquet vase dating from 580 B.C. to 570 B.C., which were stolen from Italy and recently turned up at Christie's auction house in New York. Overall, theft of Italian artworks decreased 14.5 percent in 2009 compared to 2008, thanks in part to better international collaboration, better security monitoring at museums and archaeological sites and beefed up cultural heritage data banks, officials said. Film Society of Lincoln Center and MoMA to Present the 39th Annual "New Directors/New Films"